As the other blog posts that I have written for the DIU will attest to, I repeatedly find myself drawn to archival artefacts and stories that show the always “in-process” nature of archives. While the word archive might initially bring to mind shelves full of preserved books and artefacts, collections kind of frozen in time and stoically telling a particular story, those working in archives will attest instead to the truly dynamic nature of archives. In fact, Tom Schofield et al. have introduced the term “archival liveness” as a concept that “promotes a view of the archive as a set of on-going professional, institutional and technical processes and precipitates a focus on the different kinds of temporality embodied within these” (“Archival Liveness”, 2015). What the idea of archival liveness gets at is that as our socio-technological, historical, and cultural moments change, so too does our ability to engage with archives. Cataloguing must be done to make an archive discoverable and searchable, but this costs time and money, and so archives exist at different stages of complete or incomplete cataloguing. Moreover, as time passes, archives typically grow, or sometimes shrink if things are lost, and they are remediated through various preservation, restoration, and, in our current digital world, digitization processes, all of which requires new forms of discovery and engagement with the archived collections. Archives are therefore always embedded within shifting networks of mediation and distribution. Over the past few months, I have had a chance to experience first-hand the work that goes into keeping up with the dynamic liveness of archives. The University of Edinburgh Iconic Items represent some of the University’s most important treasures. As such, this year, University librarians, archivists, and the DIU have been working in collaboration to make sure that these Iconics are fully catalogued and that their catalogue records are linked to the metadata surrounding their digital surrogates (the high resolution photographs which give them an online presence). My job has been to search for the existing catalogue records, and when these records are found, link them to the digital images, while also ensuring that the image metadata and the catalogue record agree. Where I have found a catalogue record to be missing, I can then escalate this to the appropriate librarian or archivist to have a record created. Not only will this help to keep the growing mediating networks surrounding our Iconics clean and interlinked, it also provides the ground work for shifts in how we manage our images, as we move towards using a more dynamic IIIF image viewer. (And so, as always, change begets change). Working through these catalogue records and the digital surrogates has given me personally a chance to become better acquainted with the rich treasures in our Iconics collection and to share that, I am going to devote the latter part of this blog post to shining a spotlight on some of these Iconics that I think best embody the feeling of a lively archive. Many of the Iconics are not only hugely important for the information that they provide and the history that they archive but also for their presence as stunning aesthetic and/or artistic artifacts. 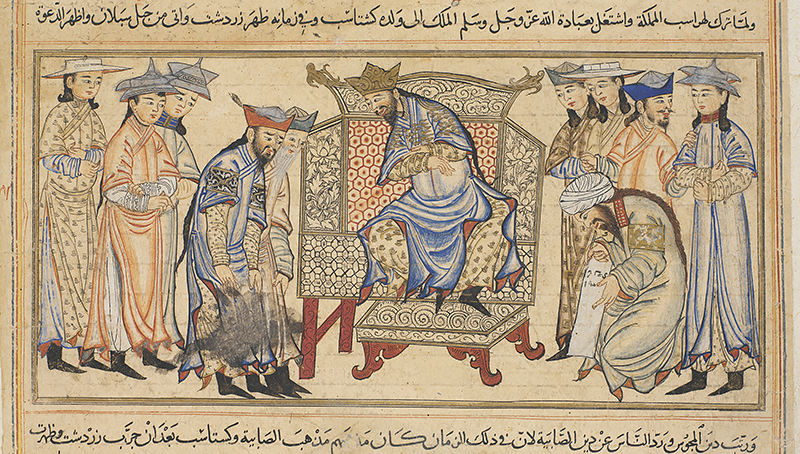 Two such unmatched manuscripts are the History of the World, by Rashid al-Din (Or.Ms.20), a world history written in the Naskh script and including 70 illustrated folios, which was almost certainly completed in Rashid al-Din’s lifetime, making it one of the earliest copies in existence and one of the most important medieval documents in the world, and the Chronology of the World, by Abu al-Raihan al-Biruni (Or.Ms.161), a compendium and chronicle of a vast number of calendars and chronological systems thought to have been copied in 1307 and used as the archetype for three later versions that were used by Edward Sachua to translate the text from Arabic to English in the nineteenth century. 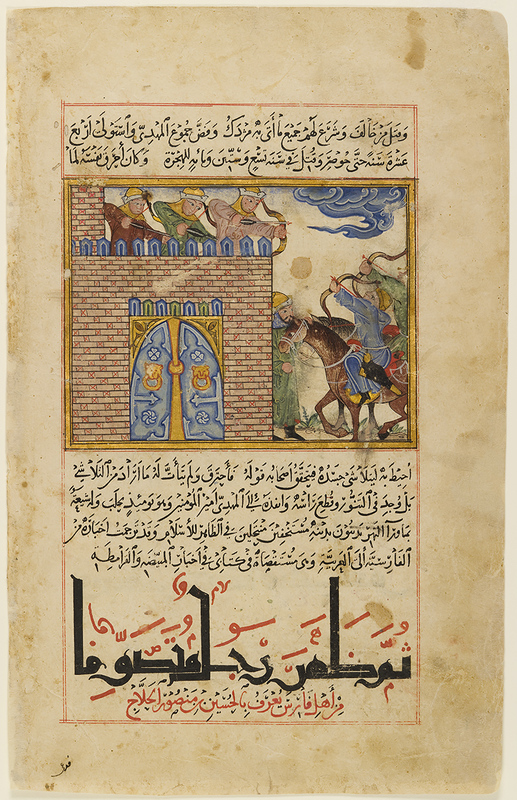 The lavish and astonishing colours in these manuscripts, combined with the height of skill used to execute the illustrations, allow these texts to maintain the striking presence they would have had so many centuries ago. 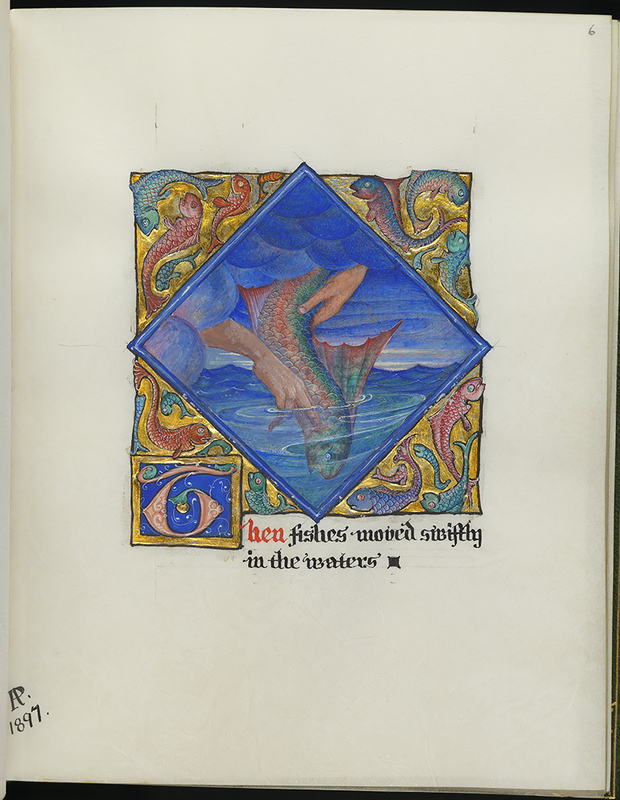 Another stunning aesthetic artefact in our Iconics is the ‘Song School St Mary’ vellum manuscript by Pheobe Anna Traquair (Gen.852), which, whether in person or in photographs, positively glows. Traquair’s beautiful images seem to stand off the page and a sense of vitality runs through each one. For more on this text, a previous DIU blog post by Susan Pettigrew provides some lovely background for the text, and gives a peak into the Song School murals at St. Mary’s Cathedral as well. The University of Edinburgh has a rich collection of charters from across the centuries, but one of my favourites is the compelling Bohemian Protest (Coll-1698). This protest was created by the Bohemian nobles against the burning of religious reformer Jan Hus in 1415. 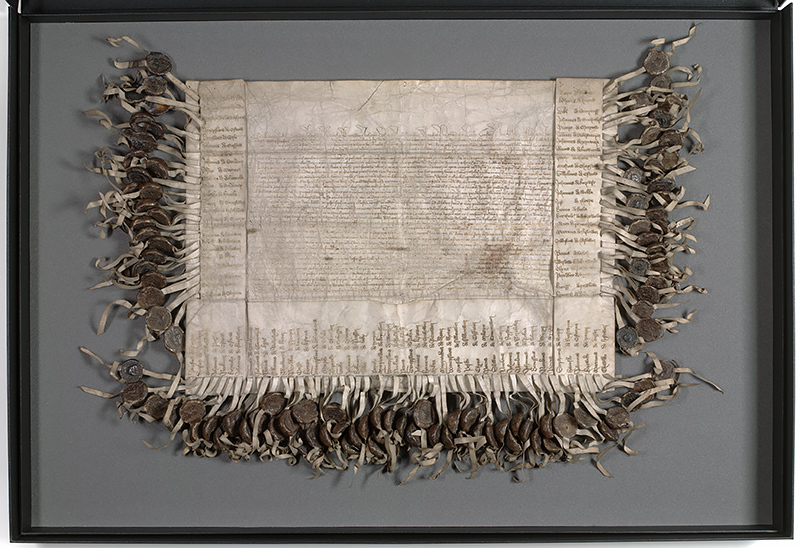 In addition to bearing the name of each noble, the protest has attached to it vellum strands that act as a fringe around the document, and on each strand is one of the nobles’ seals. The impact of seeing all the seals, each standing in for a noble, give the document a striking weight and presence that I can only imagine speaks to the strength of feeling that went into the creation of the document. The last thing that I will highlight in this post that struck me about the Iconics was how diverse the archived items are. In addition to the beautiful manuscripts and charters that I had perhaps expected, there were some more surprising items as well. 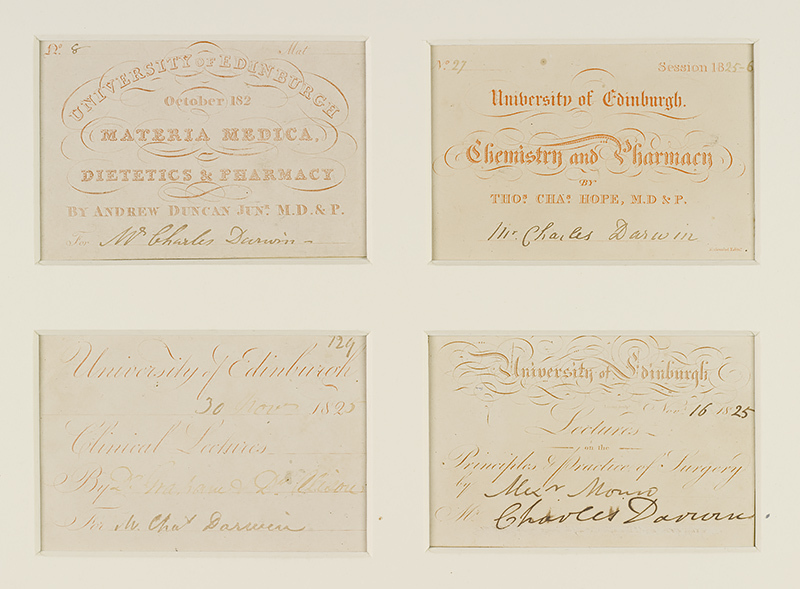 There are, for example, class cards for Charles Darwin (EUA CA6) from his time here at Edinburgh University and a small preserved sample of Alexander Fleming’s penicillin mould (Medals 110). 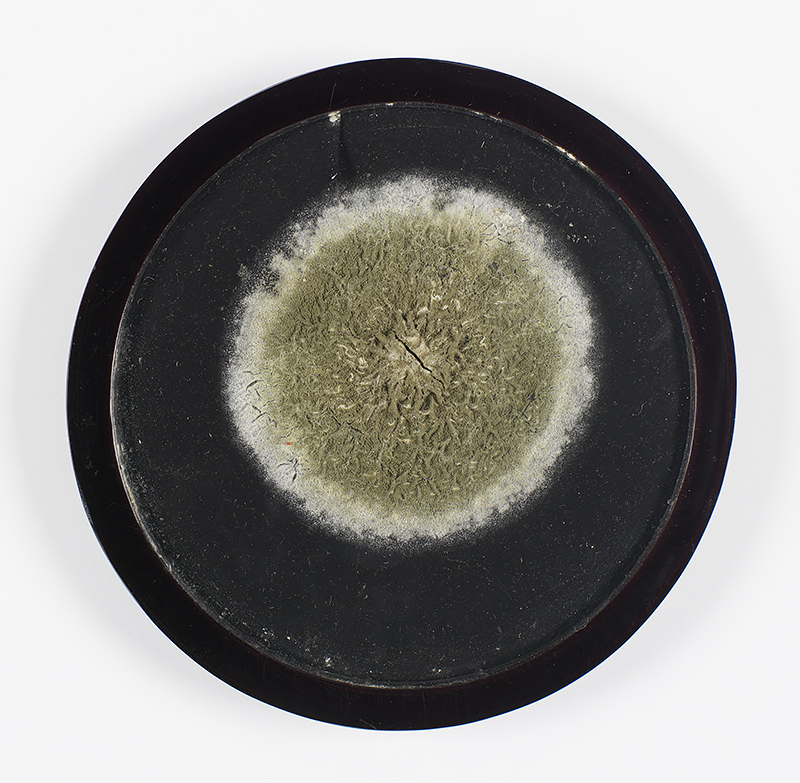 These very material traces of lives lived and work undertaken acts as a lovely reminder of how vibrant archives can be (with the mould in particular bringing a whole new sense to the term archival liveness, seeing as it archives an actual fungus!). Of course, every archival artefact, Iconic or not, speaks with a liveness and vitality, and finding ways of seeing with new eyes and hearing with new ears that ways in which this vitality makes itself known is, for me at least, a large part of the fun of working with archives. I have written about the papers of Robert Burns in the Laing collection, including a scrapbook-like page that shows the traces of almost two centuries of changing hands, and I have written about the vibrant afterlife of Lady Grange a revealed through the many papers and stories that have accumulated around her.